Have you ever moved to a new house? We have. Many times. It always takes awhile to get things how you want them. My list of projects feels endless. 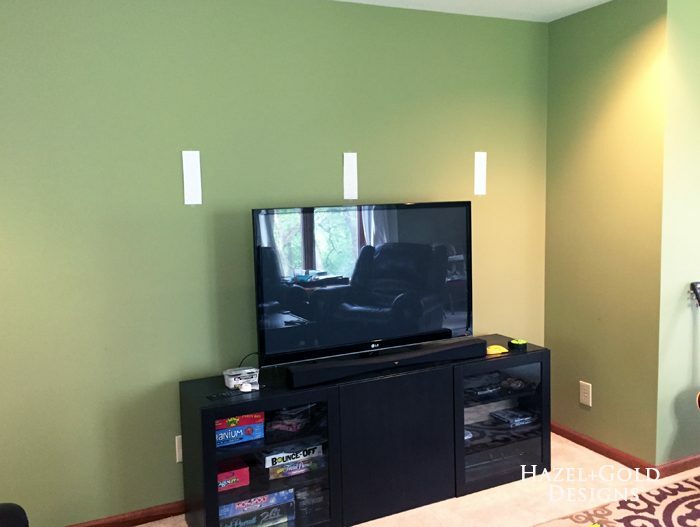 The space above our television in our family room was bare, and I was at a total loss as to what to put there. 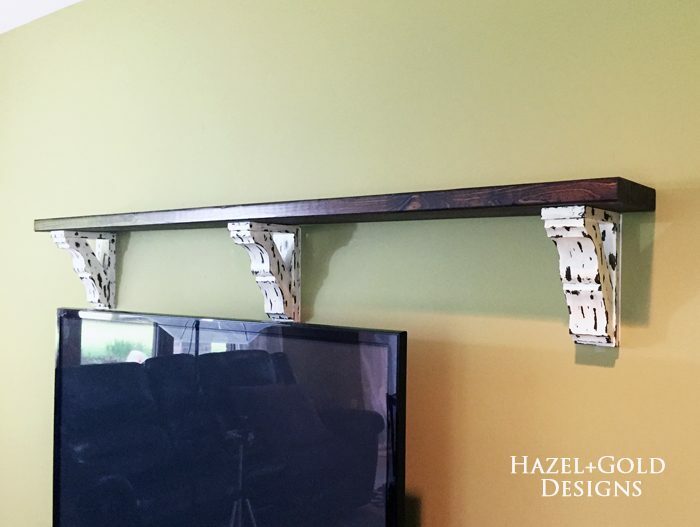 But then I came across the collection of corbels at Osborne Wood Products and I just knew that they would be perfect for putting a large corbel shelf above the TV. Now remember, as you look at these photos, that this room is NOT how I’d like it yet. My plans are huge, including board and batten and crown molding and lots of paint! 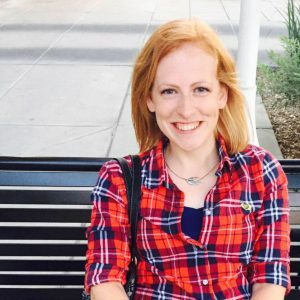 (That green has got to go!) But for now, this shelf adds tons of character and brightens up the space. It’s amazing how one addition to a room can make it feel ever so much more homey and comfortable. Plus, just keeping it real, this DIY house stuff takes lots of time and money and we all know neither are easy to come by. But, a step at a time, right? 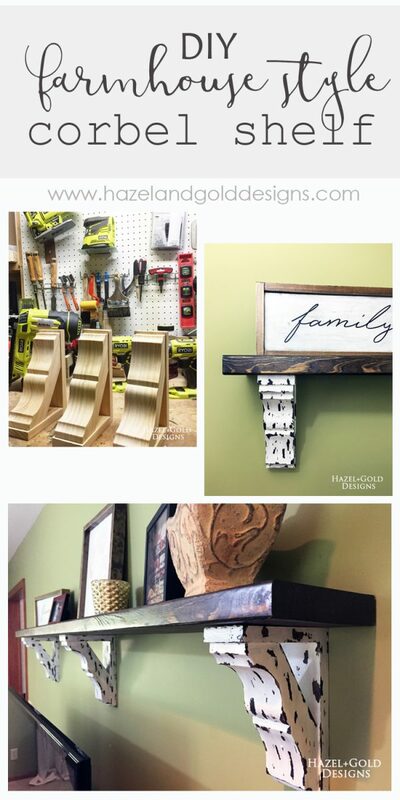 Here’s how I created this wood corbel shelf! Polyacrylic – Satin or Gloss if you like shine. 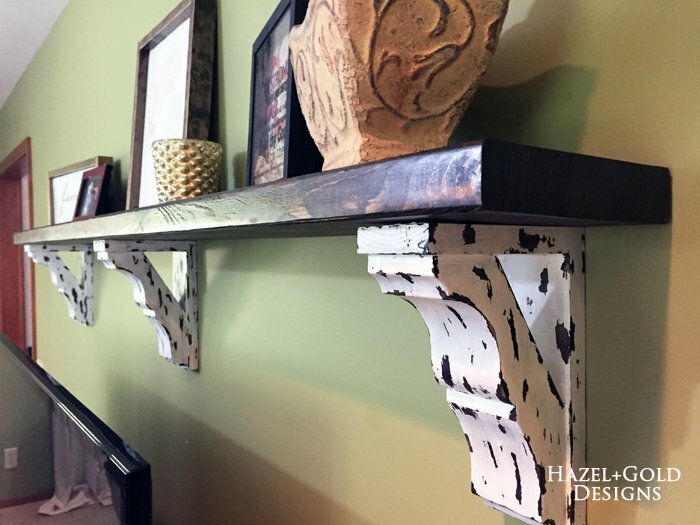 It took me awhile to decide what to do with these corbels. When I opened them and loved them even more than I did when I saw them online. 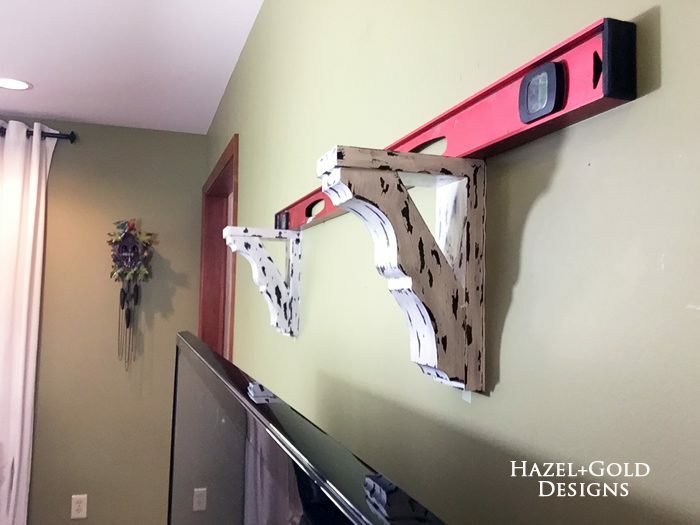 First, I want to thank Osborne Wood Products for sending them for this project, because they are made incredibly well and have all the brackets pre-installed for hanging. Osborne is a great company! 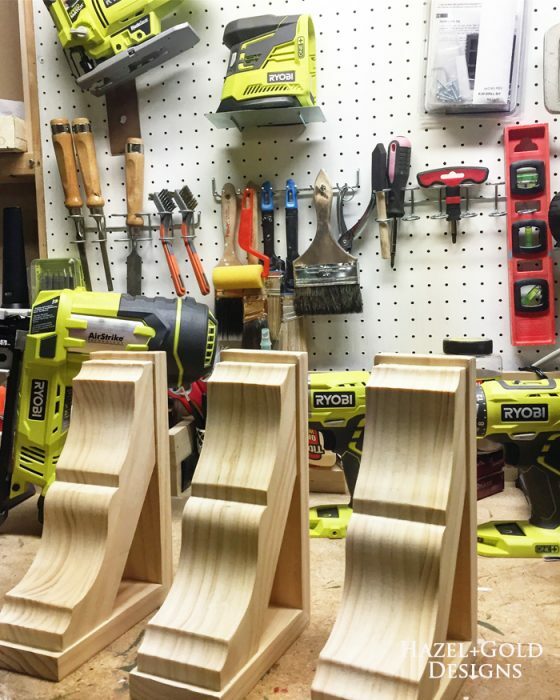 As you can see I’ve got a nice collection of RYOBI Power Tools. 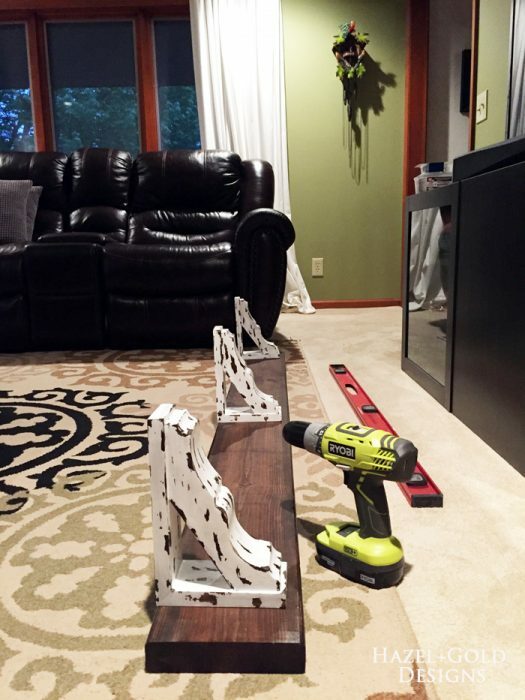 You can find this project and so many awesome other projects on RYOBI Nation website. I’ve been pretty impressed with these tools. The drill is much more powerful than my old one and I love the flexibility of everything being battery powered. Thanks RYOBI! First, I stained. I used Minwax Dark Walnut and applied it using a sponge brush and rag to wipe off the excess. They looked gorgeous. I even reassessed and considered not painting them, but again, in the space the only thing that made sense was some white. Next, I applied petroleum jelly to all the spots where I didn’t want the paint to stick. 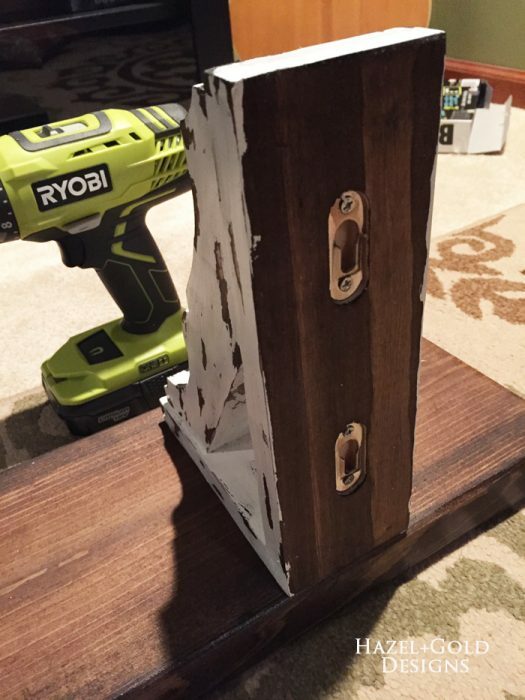 I had read about this technique in a few places, but they all used chalk paint. 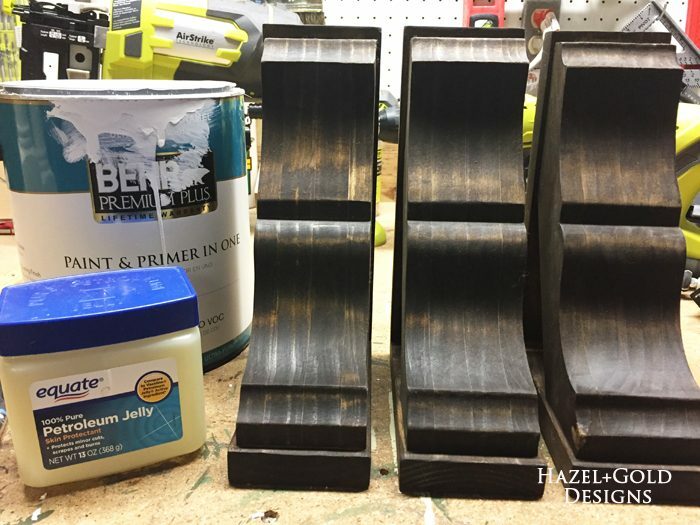 I decided to try it with this latex paint the Behr Premium Plus Paint and Primer in One . There is definitely a difference, but for the look I was going for, this worked just fine! Once I had all the petroleum jelly where I wanted it, I painted. I applied it fairly thick and you can see where the petroleum jelly is hiding under the paint. You’ll see after the paint dries that it comes off of those petroleum jelly spots very easily. 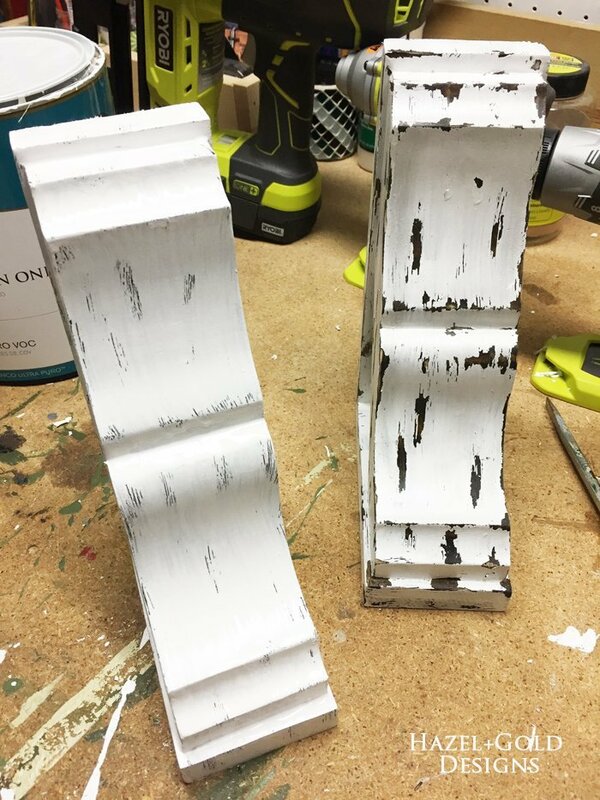 Here is one painted and one distressed. It gives it a fun chippy look, and while it doesn’t necessarily look old, it adds a lot of character. In addition to scraping off some of the paint, I also used a chisel to distress the wood a bit on the edges. This is totally up to personal preference. I wanted it to seem a little more worn than the new corbels were. Next, determine how long your shelf is going to be. 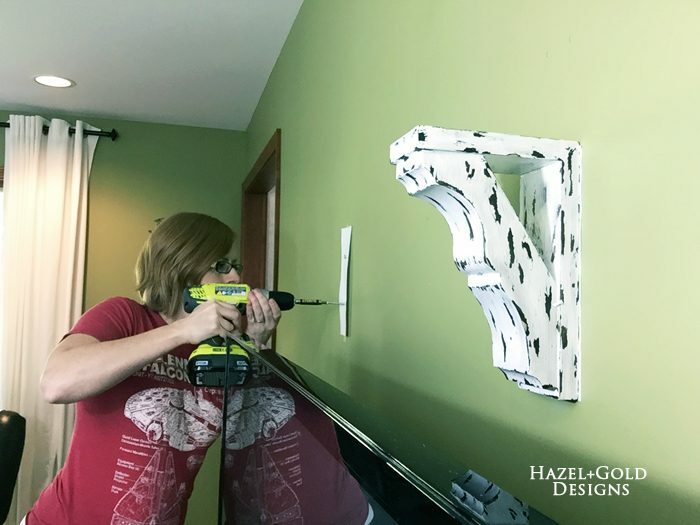 I did this by measuring where the studs were in my wall, where I wanted the corbels, and going from there. 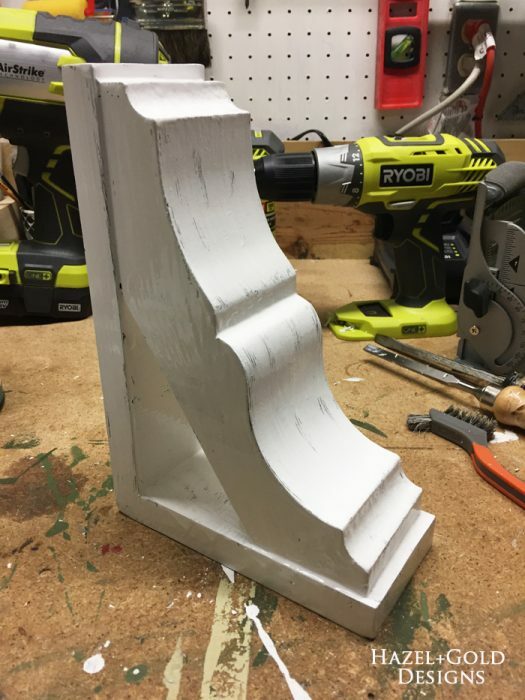 Turned out that my shelf was going to be just under 6ft wide, which is pretty big, so I used three corbels. I cut the board to size, did a dry fit to be sure it would look okay, then sanded it. 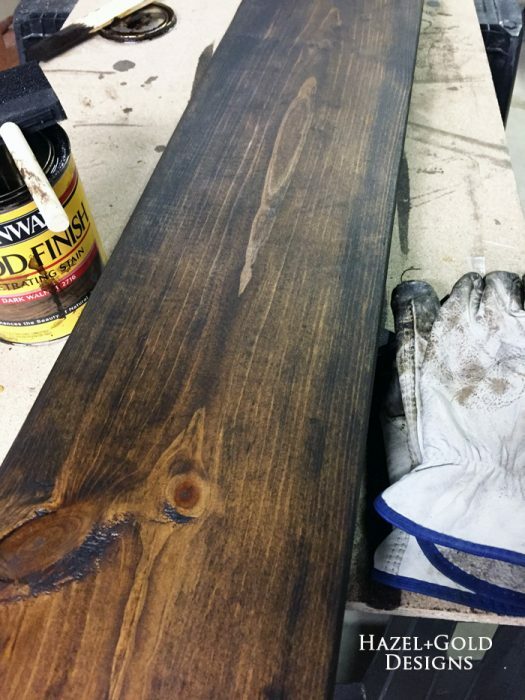 I finished it using some Dark Walnut stain to darken it up and coated it with Polycrylic . 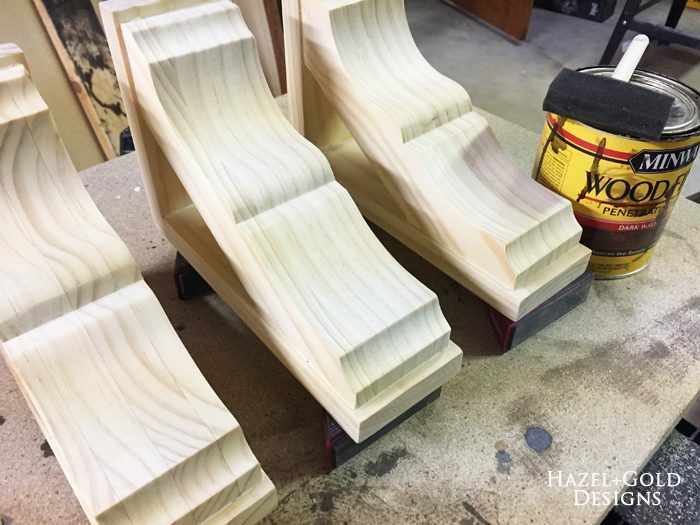 After your shelf has completed dried, dry fit the corbels on the shelf to be sure it will all fit well. 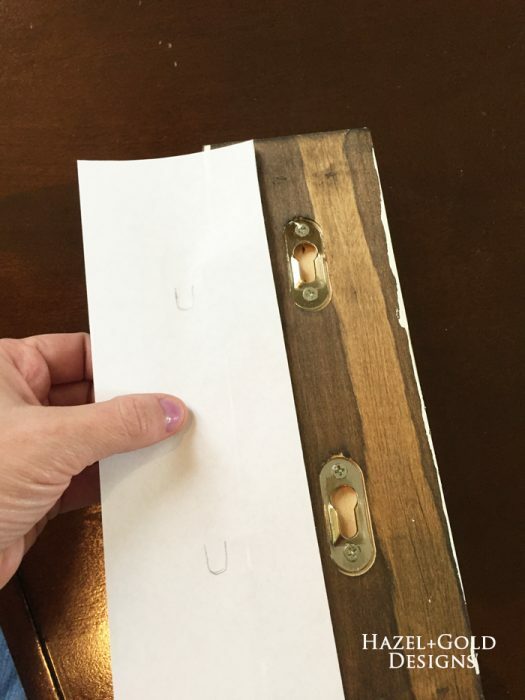 My trick for hanging things like this is to trace the back of the item you’ll be hanging and mark exactly where you want the screw to go. These corbels had brackets in them and it was important that they be lined up perfectly level with the other corbels, but also with the two screws in each one. 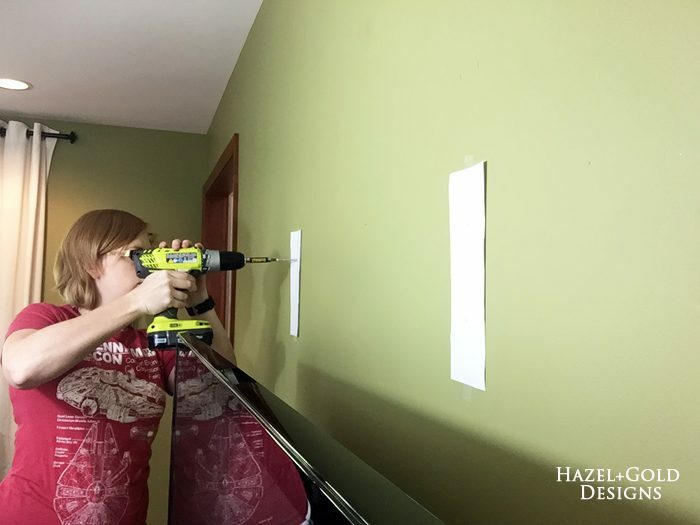 It’s a lot to line up, but by doing it on paper and taping it to the wall, it makes it pretty simple to line up before doing anything permanent! Here are some photos of that process. 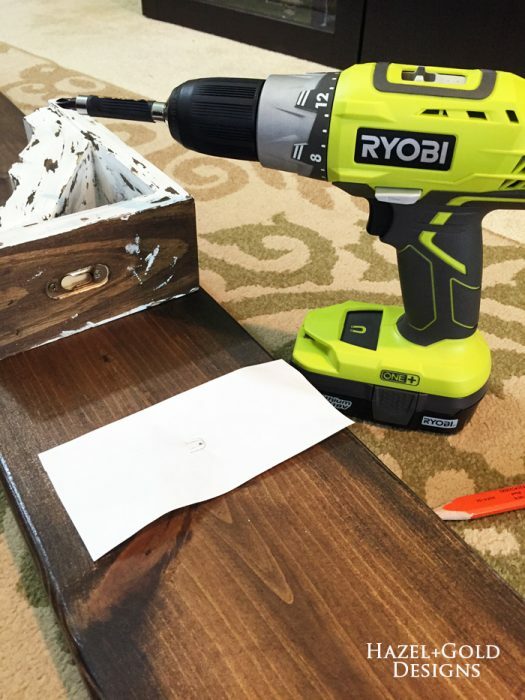 Use your awesome Ryobi drill to secure the screws into the studs. 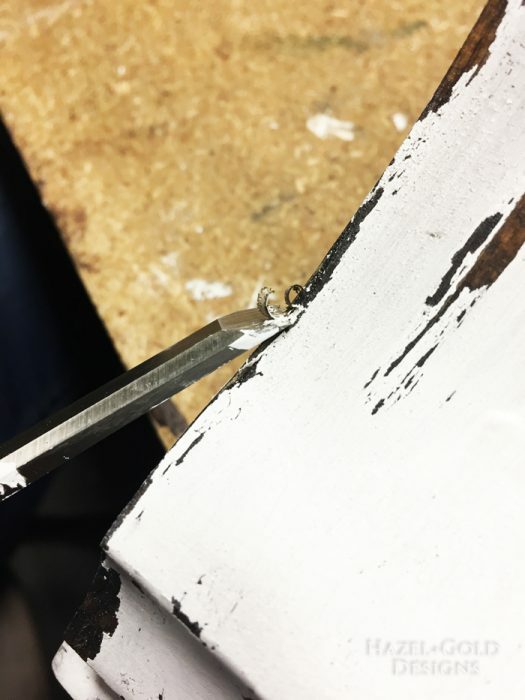 This drill works awesome and makes the job so easy! 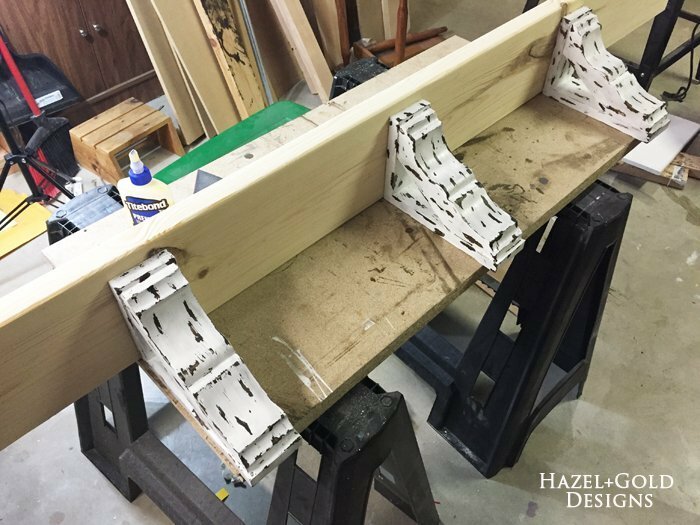 Once the corbels are all hung and leveled, go ahead and dry fit the shelf to make sure it’ll fit flat on top. 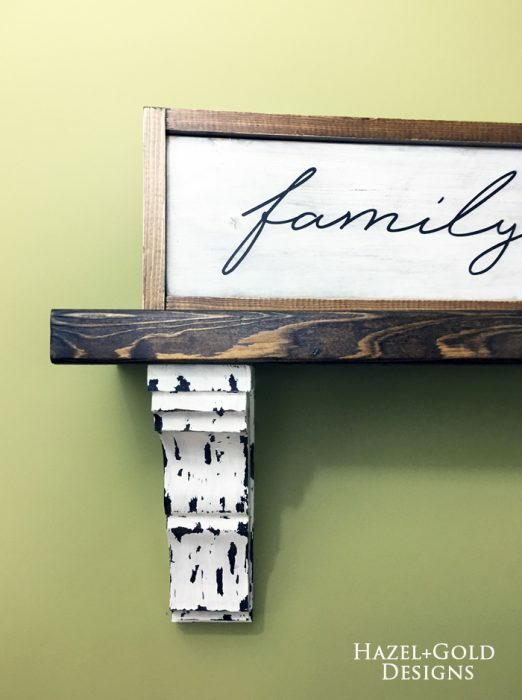 Place it where you want it by measuring the overhang on each side, then use a pencil to mark on the underside of the shelf where each corbel goes. This will help you to drill the screw into the shelf which will hold it into the bracket on top of each corbel. 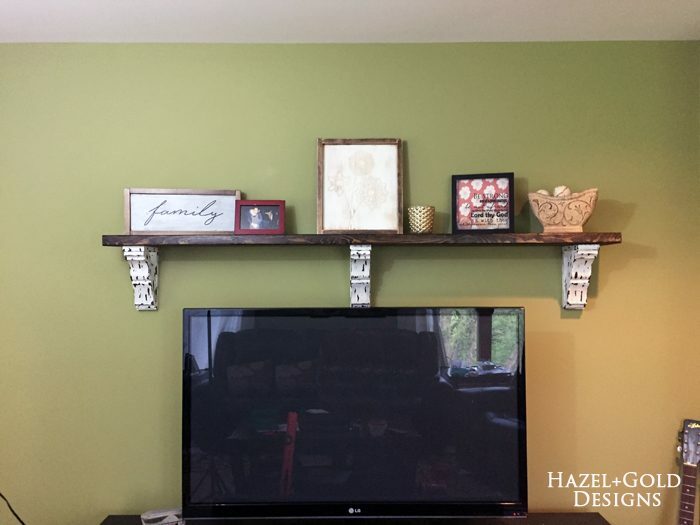 Alright, now that you have all the screws into the shelf, and the corbels hung onto the screws, lift it and hang it on the wall! Admire your handiwork, then load it up with gorgeous decor pieces. You’ll love it! 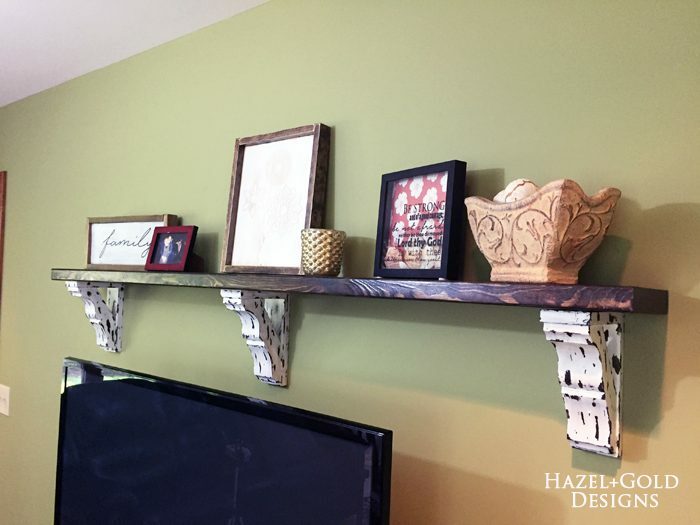 This corbel shelf project is quite simple, yet makes a huge impact in the room! Now onto plans for the walls and for another media console that matches the decor better. Always updating, always improving. I just love it! 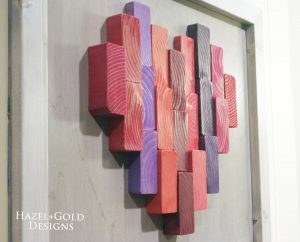 What do you think of my corbel shelf??? Please comment! Also, here’s a pinnable image for you to save to Pinterest! That is just amazing! 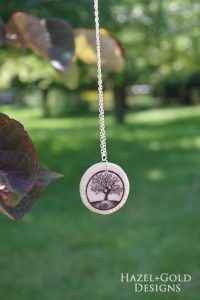 I’m always amazed by people duing such cool DIY projects, I’d never be able to pull it off! And that ‘cow’ effect is gorgeous! 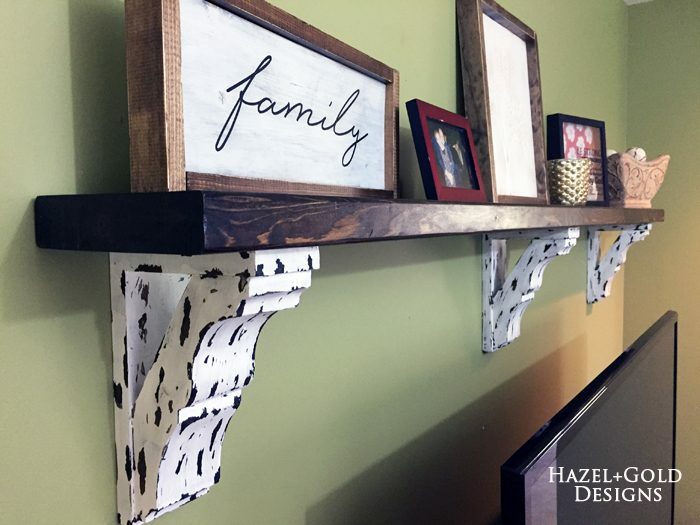 I really like the shelf, the brackets are a lovely shape…. I could do with a few of those in our lounge! These look great! 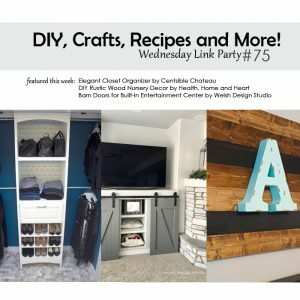 I feel inspired to take a crack at this myself now – I’m so tired of my bare walls! Wow, this is really impressive! 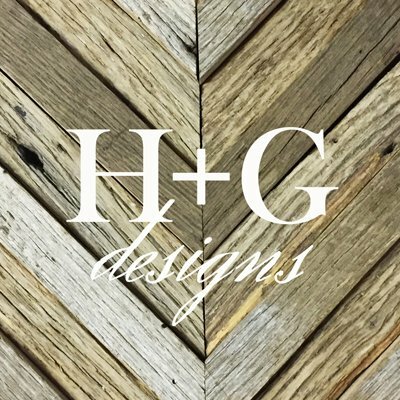 I’m always in awe when people can make things themselves that end up looking really professional!